Here is a fundamental truth about Donald Trump and his children: Everything they touch, no matter how seemingly well-intentioned, is done with the singular purpose of turning a profit. While Midas’s touch may have originally been a curse, a mythological tale meant to warn about the ultimately fatal price of greed, for the Trump family, the ruthless pursuit of profit seems to operate without any repercussions. Numerous reports have already demonstrated how Trump used both his charity and his campaign to pay his business, and it’s increasingly an accepted reality that the White House has become a platform to continue to grow Trump’s business assets. Now, a new report from Forbes details how Trump and his family used the Eric Trump Foundation to dip into donations intended for St. Jude, a non-profit dedicated to treating children with cancer. [...] the Donald J. Trump Foundation donated $100,000 to the Eric Trump Foundation—a gift explicitly made, according to Gillule, to offset the increased budget. Thus, the Eric Trump donors were still seeing their money go to work for kids along the same lines as previous years. In 2012, the Eric Trump Foundation sent $5,000 to a charity called Abilis, which provides services to people with disabilities. That same year, Donald Trump’s nephew Fred Trump, whose son has cerebral palsy, hosted the inaugural Golf for Abilis fundraiser at the Trump National Westchester. Over the next five years, Abilis spent an estimated $240,000 hosting tournaments at the property. 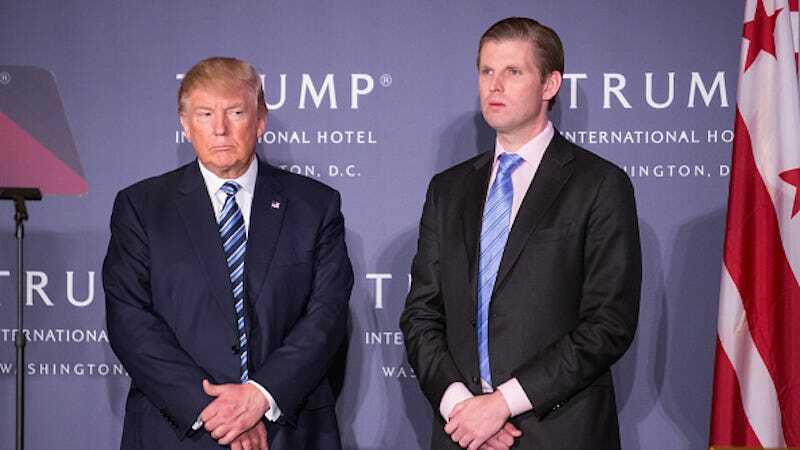 Essentially, Forbes reports, the Eric Trump Foundation was taken over by his father through the Donald J. Trump Foundation and reorganized as a pass-through of sorts. Money originally intended for children with cancer became yet another means of profit for the Trump properties. It’s not exactly clear whether or not the movement of money is legal; Forbes writes that it “seems to defy” state and federal tax laws. What it is, however, is typical of the Trump family worldview. In their planet, everything—even St. Jude and its young patients—exists solely to enrich the Trump family, regardless of the costs.